Acute illness, particularly in frail older people or those recovering from serious injury or surgery, increases the risk of a fall in hospital. Patients are vulnerable to delirium, dehydration and deconditioning, all of which affect balance and mobility, especially in unfamiliar surroundings. The majority of falls occur among medical inpatients during the first few days after admission. These circumstances mean that not all falls are preventable. However, successful implementation of guidance from NICE may prevent 20–30% of falls.4 Prevention depends upon prompt assessment to identify potential risk factors, followed by clinical responses to ameliorate their effects. This is a complex task requiring a multidisciplinary team approach. One patient may require several individually tailored interventions. It also requires a patient safety approach throughout the organisation, with practical support such as walking aids being always available, a culture of reliable incident reporting, and clear accountability and commitment from senior leaders. 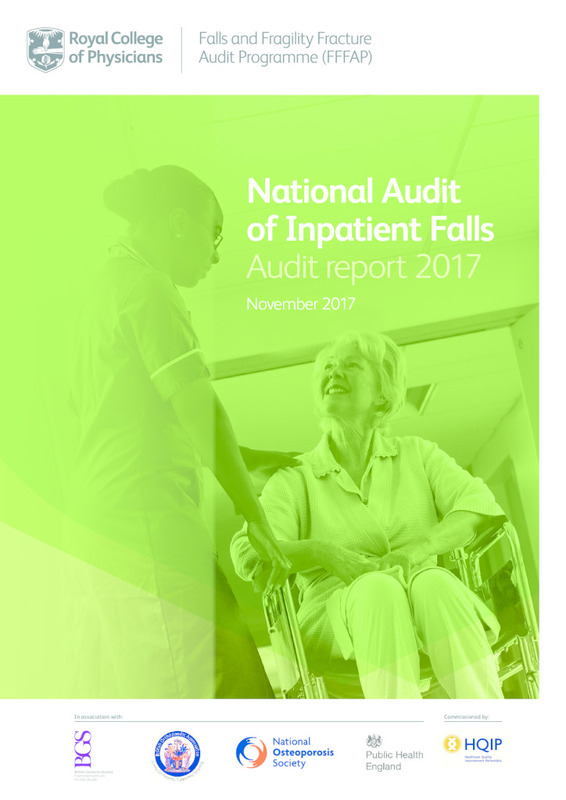 The National Audit of Inpatient Falls (NAIF) was designed to capture all these elements. It is based on NICE guidance and advice from NHS Improvement (NHSI). In May 2015 NAIF collected data about the leadership responsibilities, policies and procedures from 96% (136) of acute hospital trusts and LHBs in England and Wales, and 90% (179) of hospitals provided clinical data about the assessments and interventions they had recorded within 3 days of admission for a total of 5,174 patients. Of the data submitted, 94% were of suitable quality for analysis.